The surface features of the northern and southern hemispheres of Mars are very different. In this topographic map, the northern hemisphere (shown in blue) is mostly smooth lowlands and has experienced extensive volcanism. The southern hemisphere (in orange) has an older, cratered highland surface. This dichotomy could have been caused by a giant impact. New research has revealed that a giant impact on Mars more than 4 billion years ago would explain the unusual amount of "iron loving" elements in the Red Planet. Planets form as small dust grains stick together and agglomerate with other grains, leading to bigger bodies termed "planetesimals." These planetesimals continue to collide with each other and are either ejected from the solar system, gobbled up by the sun, or form a planet. This is not the end of the story, as planets continue to accrete material well after they have formed. This process is known as late accretion, and it occurs as leftover fragments of planet formation rain down on the young planets. When proto-planets accrete enough material, metals such as iron and nickel begin to separate and sink to form the core. This explains why Earth's core is mainly composed of iron, and it is expected that elements that readily bond with iron should also mainly exist in the core. Examples of such 'iron loving' elements, known as siderophiles, are gold, platinum and iridium, to name a few. Just like Mars, however, there are more siderophiles in the Earth's mantle than would be expected by the process of core formation. "High pressure experiments indicate that these metals should not be in the mantle. These metals don't like being dissolved in silicate and instead they prefer to sink through the mantle into the Earth's core," Brasser tells Astrobiology Magazine. "The fact that we do have them at all means that they must have arrived after the core and the mantle separated, when it became much more difficult for these metals to reach the core." A 2016 paper by Brasser and colleagues conclusively showed that a giant impact is the best explanation for Earth's high siderophile element abundance. The amount of siderophiles accumulated during late accretion should be proportional to the 'gravitational cross section' of the planet. This cross section is effectively the cross hairs that an impactor 'sees' as it approaches a target planet. The gravitational cross section extends beyond the planet itself, as the world's gravity will direct an object towards it even when the object was not on a direct collision course. This process is called gravitational focusing. The earlier paper showed that Earth has more siderophiles in the mantle than it should, even according to the gravitational cross section theory. The scientists explained this by showing that an impact of a lunar-sized body on the Earth (in addition to the event that formed the moon) would have enriched the mantle with enough siderophiles to explain the current value. Rock-forming elements such as silicon have the highest abundance in the Earth's crust. The rarest are the siderophile "iron loving" elements as most of them have sunk into the core of the planet. However, there are still more iron loving elements in the crust and mantle than there should be. 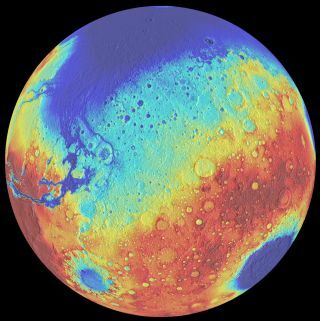 Analysis of Martian meteorites show that Mars accreted another 0.8 percent by mass (weight percent, or wt percent) of material via late accretion. In the new paper, Brasser and Mojzsis show that for Mars to have amended its mass by about 0.8 wt percent in a single impact event required a body at least 1,200 kilometers in diameter. They further argue that such an impact ought to have occurred sometime between 4.5 and 4.4 billion years ago. Studies of zircon crystals in ancient Martian meteorites can be used to date the formation of the Martian crust to before 4.4 billion years ago. As such, a giant impact should have caused widespread crustal melting and such a catastrophic event must have occurred before the evidence for the oldest crust. If the impact occurred as early in the planet's history as 4.5 billion years ago, then the siderophiles should have been stripped away during core formation. This history provides firm bookend constraints on when the impact happened. Understanding late accretion is not just important for explaining the siderophile abundance, but also for placing an upper limit on the age of Earth's biosphere. "During each impact, a small bit of Earth's crust is locally melted," says Brasser. "When the accretion is very intense, almost all of Earth's crust is molten. As the accretion intensity decreases, the amount of crustal melting also decreases. We argue that the earliest time you could form a biosphere is when the accretion is low enough so that less than 50 percent of the crust is molten at any given time." The surface of Mars also has an unusual dichotomy, which could be explained by a giant impact. The southern hemisphere exists as an ancient cratered terrain, and the northern hemisphere appears younger and smoother and was influenced by extensive volcanism. A giant impact might also have created the Martian moons, Deimos and Phobos, although an alternative theory is that the highly porous Phobos could be a captured asteroid. The work wasfunded by the NASA Exobiology and Evolutionary Biology program and by the John Templeton Foundation through the Foundation for Applied Molecular Evolution (FfAME) origins program.